Is your child showing interest in the medical field? Maybe they’re asking to take your temperature to check for a fever? Doctor roleplay is always a popular game among children. And we’ve found some of the best toy doctor kits to make their play come to life. But before we reveal them, we’ll give you an idea of what to look for and what your child could gain from owning a toy doctor kit. So, the next time you’re feeling a toothache or stomach ache coming up, you know where to find a doctor. Use the links above to check the latest prices or read our in-depth toy doctor kit reviews below. When considering a toy doctor kit for your child, there are a few things you might like to keep in mind. Let’s take a closer look. Most toy doctor kits are safe for a wide age range. However, as with any other toy, it might be best to buy something that’s recommended for your child’s age. For instance, toys recommended for older children often have smaller parts. In the hands of a toddler, these could become a hazard (source). Another safety concern is the material used. It’s essential that everything is washable to get rid of germs, especially any fabrics. Also, if you find a doctor kit with a working stethoscope, make sure they only listen to heartbeats and don’t misuse it. Your child’s hearing is fragile and can be damaged by prolonged exposure to loud noises. 2. What Should the Kit Consist Of? When you get your child a doctor kit, you want to make sure it includes the right tools. The kit, of course, doesn’t have to resemble that of a real doctor. But it might keep your kiddie more interested if they at least get the “basic” set. The basic things could be a kit with a working stethoscope, a thermometer, play bandages and maybe even a carrying bag or coat. Some kits will also include a toy syringe and other small accessories. This might be a good way to help your child get over their fear of needles (source). Then there are also kits directed towards dental health. These kits might consist of cups, dental mirrors, and even teeth for practice. 3. What’s the Benefit of a Doctor Kit? 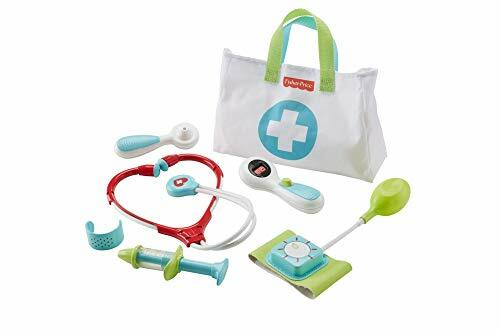 Finding a good toy doctor kit might help your little one be more at ease when actually going to the doctor. Apart from that, it can even help your child’s intellectual development. As your child plays with their new kit, they’ll naturally begin to question each tool. How does the stethoscope work? What is the tiny hammer for? This curiosity could help children to learn more about the human body and how it works. It will encourage them to ask questions and seek answers (source). 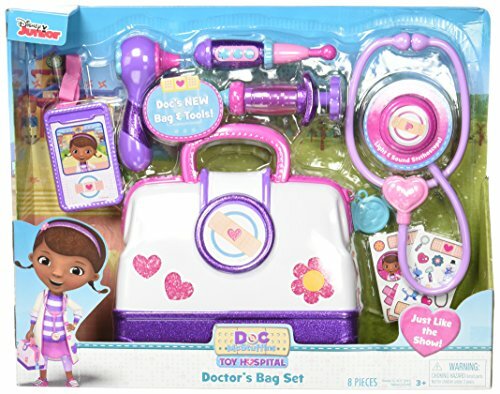 Now that you know more about how we chose the items on our list, it’s time to reveal the best toy doctor kits for kids. Whether you have a baby or an older toddler, we’ve got something for everyone. Let your child immerse themselves completely in their imagination with this dress-up set. It features a reflex hammer, ear scope, syringe, doctor’s jacket, a mask, and a name tag. It also comes with a stethoscope that makes realistic heartbeat sounds. The jacket and mask will allow your child to not only play the part but actually look the part as well. And the best thing about the jacket and mask? They can be washed in the washing machine. This dress-up set has been designed with children aged between 3 and 6 years in mind. All the tools are easy to hold and work with. The jacket even has pockets to keep all the essentials close at hand. 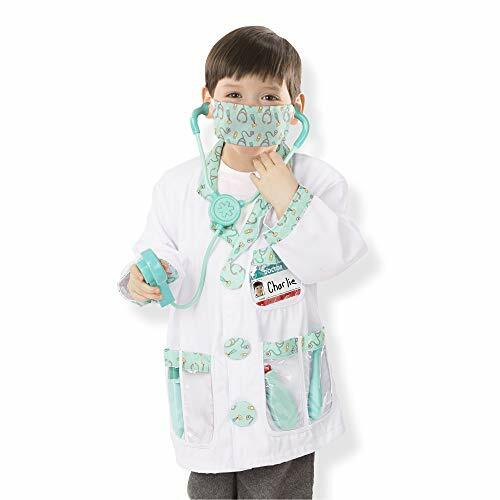 Lets your child look and feel like a real doctor. Electronic stethoscope. Batteries not included. Machine washable mask and jacket. This is an excellent present for a budding medic. 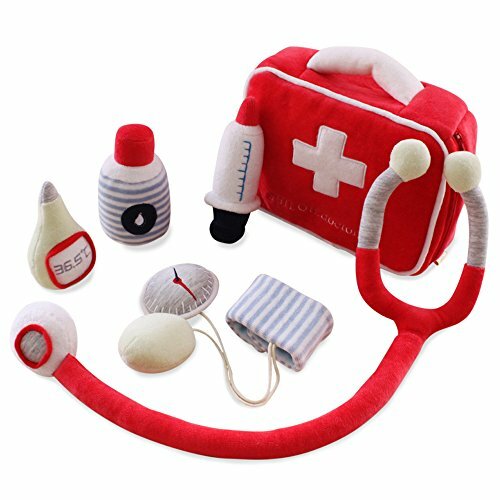 The kit includes a super cute bag filled with things a tiny doctor might need. It includes a stethoscope, thermometer, syringe, and an otoscope. The stethoscope features fun lights and sounds to make play a little more magical. The set also comes with a name tag and colorful stickers. Your little girl can use her newfound medical skills on you or even her dolls or stuffed animals. The doctor kit includes small parts, so is not safe for children under 3. Includes fun accessories, such as a name tag and stickers. Stethoscope batteries run out quickly. The bag is on the small side, so it’s difficult to fit everything in. 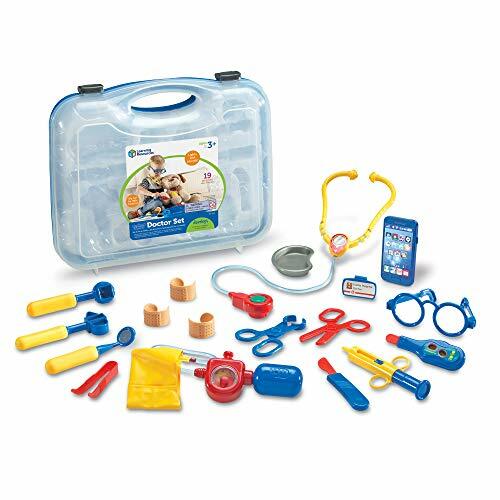 If you want to help your child feel like a real doctor, this kit might be what you need. Similar to the products from the brand Little Pretender, it includes a bunch of tools that will allow your preschooler to look and feel the part. It includes a variety of supplies, from bandages to a dental mirror. This kids doctor kit also comes with a handy storage case. All the tools have their assigned place so you can make sure everything is there. The working stethoscope comes with batteries, although the cell phone doesn’t — for this, you must provide your own. These make a fun addition to the kit with realistic sounds. The kit comes in blue or pink and is suitable for both boys and girls aged 3 and over. Large kit with 19 pieces. Fun additions, such as glasses and a cell phone. Comes in pink and blue. Some parents said the kit is a bit flimsy. 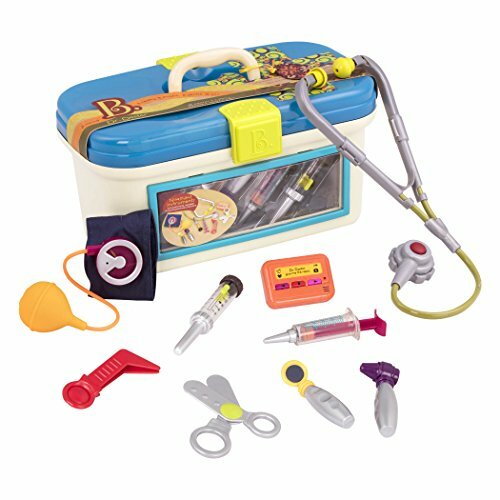 A favorite among many parents is this medical kit designed for preschoolers. It features a stethoscope, ear scope, thermometer, blood pressure device, bandage, syringe, and a carrying bag. To make it even more fun, the kit has a few surprise effects. Use the thermometer not only to check if the patient is sick but also when they are well again, with the push of a button. As your little doctor checks your blood pressure, they can make the gauge spin. The bandage works similar to a cuff bracelet, so it’s easy to put on and take off. Recommended for ages 3 to 6 years. The old-school style of the bag is cool. Features a pretend digital thermometer. The fun effects are unique. The stethoscope doesn’t pick up a heartbeat sound and the earpieces are large. 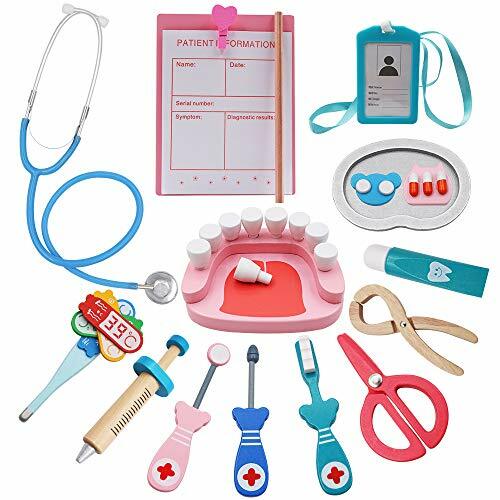 This kit includes all the parts your child needs to be the dentist they want to be, but they can also play doctor or nurse when they want. There is a toothbrush, toothpaste, oral mirror, and more. It even includes a palette with removable teeth. All the dental tools are made of high-quality wood and painted with non-toxic paints, so they’re excellent for children ages 3 and up. Playing with the toothbrush and teeth could help your child learn how to brush their own teeth. It might also make them more comfortable when they need to visit the dentist. The doctor kit also includes a magnetic thermometer, syringe, pretend pills, name tag, and a clipboard. The stethoscope may just be the best part since it actually works! Kit with a working stethoscope. Three professions to choose from. Stethoscope seems to be flimsy. Pretend play is for everyone, and now the youngest members of the family can join in as well. Everything in this kit is soft to the touch. All the items are large and the details are embroidered, so there are no choking hazards. Constructed from baby-friendly materials, the pieces are easy to surface clean. Just grab a damp cloth and wipe the germs away. In fact, they’re specially packed so dust is unable to penetrate and cause a build-up on the inside. There’s an echometer, thermometer, medicine bottle, blood pressure device, injector, and a case to carry it all. Suitable for young babies. Everything is large and soft. Made with tightly packed velvet and cotton. Not machine washable for optimal cleaning. Toddlers tend to explore with all their senses, so it’s crucial to eliminate any choking risk. Everything included in this kit is a good size and made of non-toxic plastics, so you won’t have to worry about your youngster’s safety. The set includes a bunch of fun medical tools for your kiddie. It features a syringe, blood pressure cuff, thermometer, scissors, tweezers, and stethoscope. Your child will also get a pretend beeper, similar to an old-school pager, so they’ll know when they’re needed. 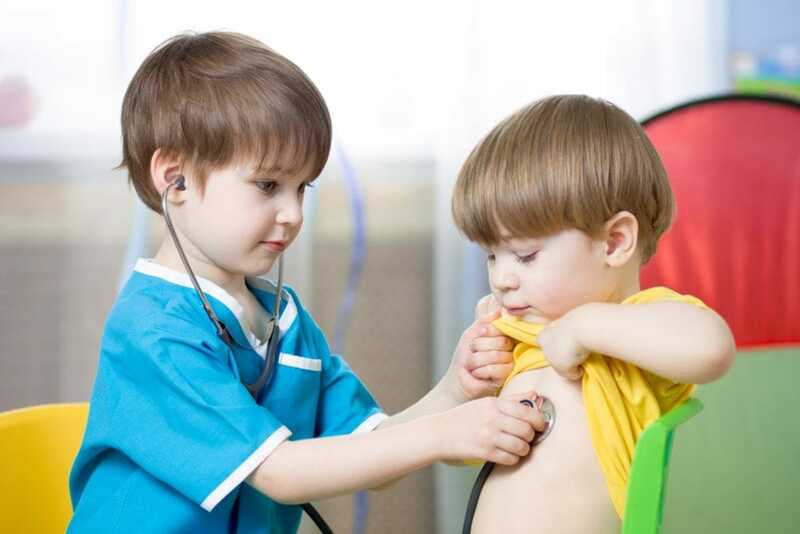 Show your little one how to use the stethoscope, which even sounds like a real heartbeat. Your child will also get a case to transport and store all their medical tools. Suitable for ages 18 months and over. Stethoscope with a heartbeat sound. Includes a beeper for even more realistic play. The case is oversized for the contents. The pediatrician is one of the first authority figures your child will know. Therefore, it’s natural that children will feel curious about the doctor’s tools and how they’re used. We had great fun reviewing the best toy doctor kits for kids, and our favorite is the Melissa and Doug Doctor Play. Made from high-quality materials, it has everything your child needs for hours of fun, plus it’s easy to clean. Is your child becoming more interested in the medical field? Do you think a doctor kit could make doctor visits a little easier? Share a comment with your thoughts below.